Although Canada is a large country, many areas are uninhabited, and most of the population lives near the southern border. The Trans-Canada Highway, completed in 1962, connects the people living in this strip of land, from St. John's in the East to Victoria in the West, a distance of 7 821 km. Canadians like hockey. 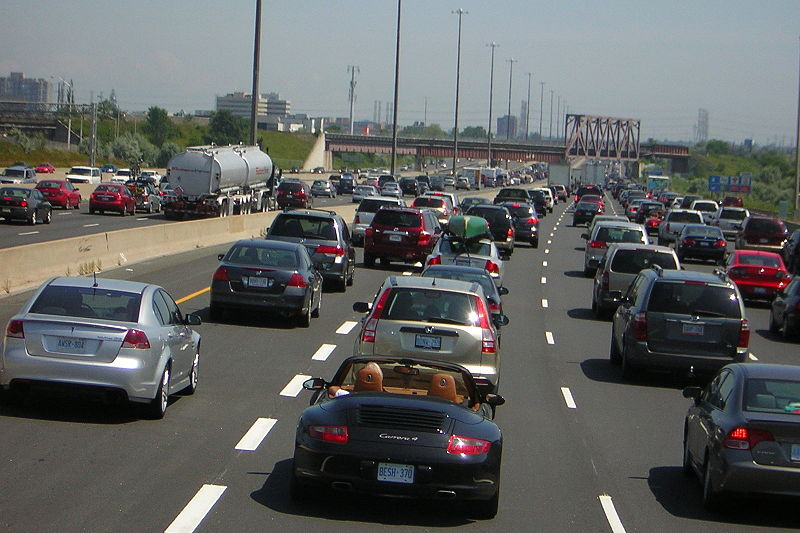 After a hockey game, thousands of fans get in their cars and drive home from the game, causing heavy congestion on the roads. A wealthy entrepreneur wants to buy a hockey team and build a new hockey arena. Your task is to help him select a location for the arena to minimize the traffic congestion after a hockey game. The country is organized into cities connected by a network of roads. All roads are bidirectional, and there is exactly one route connecting any pair of cities. A route connecting the cities c0 and ck is a sequence of distinct cities c0, …, ck such that there is a road from ci−1 to ci for each i. The new arena must be built in one of the cities, which we will call the arena city. After a hockey game, all of the hockey fans travel from the arena city to their home city, except those who already live in the arena city. The amount of congestion on each road is proportional to the number of hockey fans that travel along the road. You must locate the arena city such that the amount of congestion on the most congested road is as small as possible. If there are several equally good locations, you may choose any one. The first line of input is a positive integer N, the number of cities. The cities are numbered from 0 to N−1. The next line of input will contain an P of N positive integers. For each i, P[i] is the number of hockey fans living in the city numbered i. The total number of hockey fans in all the cities will be at most 2 000 000 000. The next N−1 lines will each contain 2 integers, representing the arrays S and D respectively. S and D are arrays of N−1 integers each, specifying the locations of roads. For each i, there is a road connecting the two cities whose numbers are S[i] and D[i]. A single integer, the number of the city that should be the arena city. As an example, consider the network of five cities in the top diagram on the right, where cities 0, 1 and 2 contain 10 hockey fans each, and cities 3 and 4 contain 20 hockey fans each. The middle diagram shows the congestions when the new arena is in city 2, the worst congestion being 40 on the thicker arrow. The bottom diagram shows the congestions when the new arena is in city 3, the worst congestion being 30 on the thicker arrow. Therefore, city 3 would be a better location for the arena than city 2. 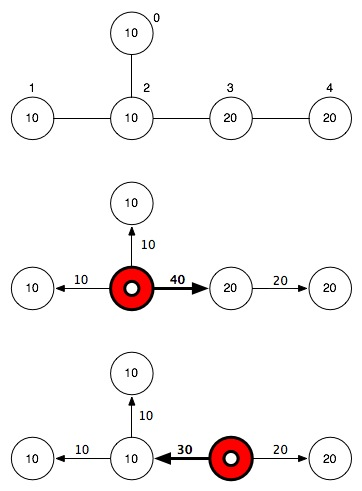 The data for this example is shown in the sample input below. Assume that all the cities lie in a straight line from East to West, and that the roads all follow this straight line with no branches. More specifically, assume that for all i with 0 ≤ i ≤ N−2, S[i] = i and D[i] = i+1. There are at most 1000 cities. Make the same assumptions as in Subtask 1, but there are at most 1 000 000 cities. The assumptions from Subtask 1 may no longer be true. There are at most 1000 cities. The assumptions from Subtask 1 may no longer be true. There are at most 1 000 000 cities. baal-hammon on Jul 20, 2015 - 1:36:59 pm UTC runtime error !! jargon on Jul 20, 2015 - 9:24:13 pm UTC Re: runtime error !! baal-hammon on Jul 21, 2015 - 2:17:36 pm UTC Re: runtime error !! Can I see what exception I'm getting? java.lang.StackOverflowError will be shown properly in the future.